Observation - Funeral Bell (Galerina marginata) - UK and Ireland. Description: growing on dead wood in a ditch in coniferous woodland. Bottom right picture is miked's photo of Kuehneromyces mutabilis (Sheathed woodtuft)for comparison. growing on dead wood in a ditch in coniferous woodland. 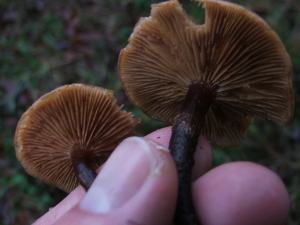 Bottom right picture is miked's photo of Kuehneromyces mutabilis (Sheathed woodtuft)for comparison.